It goes on the left side underneath the airbox where the AIS hose plugged into. I guess i need to put something on mines. I got the plates from 2wheeldynoworks, but they didnt come with a rubber plug. Any type of rubber plug will work just make sure it has something like a clamp or wire wrapped around it to keep it in place and make sure it slips over the connection! The Graves instructions say to move the radiator to reach the AIS pump electrical plug, is this necessary? Nope you can access everything from the top after you remove the air duct. I found somewhat of a simpler way of removing the tank shrouds without having to remove the scoops which is simple but seems to take more time. 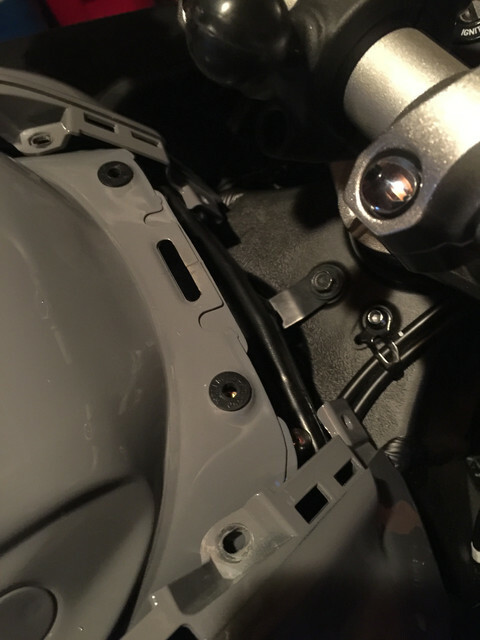 simply remove the screw at the bottom corner of the tank shroud then remove the center tank piece after that remove the two bolts that screw into the rubber grommets that are under the center piece. 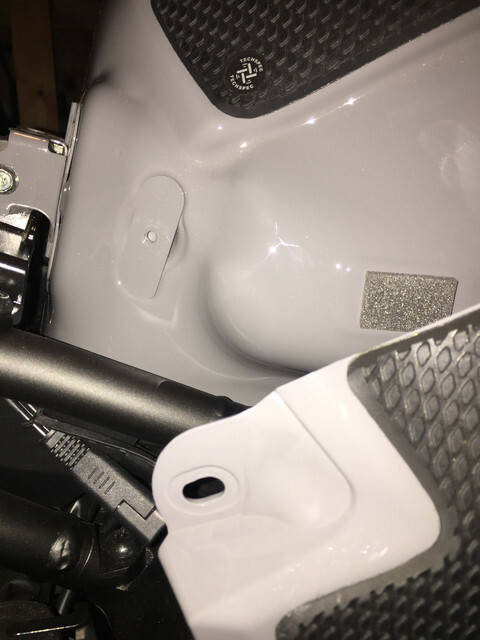 Finally pull the side shrouds straight out from around the gas cap as noted in the other post and waaalaaa you will have access to the tank bolts on each side that you can simply unbolt and swing the gas tank up to remove the hoses and gain access to the air box. No that could be costly and you could end up denting a very expensive radiator. I looked at that today after I had my tank off and was like what in the? There is hardly any room to work on it from the front of the bike. Actually more space doing it this way. This is how i do it. Just let the plastics hang to the side in one piece. 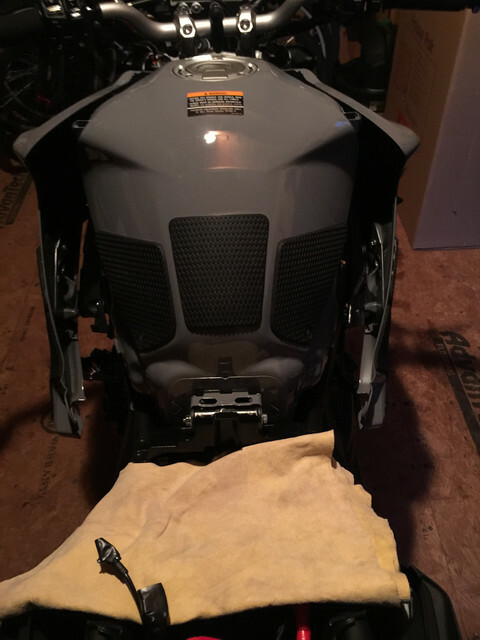 Here is a really good Video on removing the FZ10 tank/scoop and AIS . This guy is making some really good mt-10 videos. Someone tell him to come join us here! I followed that guide when I got rid of AIS, definitely the best on youtube right now as far as guides go! Great job to everyone for the tips and help. I just found a new video detailing this process on the FZ-10! Looking forward to doing mine this weekend. Nonetheless, it's a great guide and probably what I'll use as a reference when I do mine! I presume then you probably won't be doing your own spark plugs then? You can wait until you send it in for your spark plug change. This mod is basically on the way to do spark plug removal. A good mechanic won't charge you much extra, if anything at all. And be careful with any Philips heads screws. The strip with literally no effort at all. Worth noting that the grey piece that wraps around the air valve and plugs into the bottom of the air box can be rotated 1/8 of a turn and slid off the valve. Then that piece can be reinserted into the grommet in the air box. No need to cut it up. Also, I know I've seen it mentioned elsewhere but not sure if it's in this thread. Do yourself a favor and do the reflash/O2 sensor elimination at the same time. The right side O2 sensor plug is normally a mofo to get to, but with the tank off it's easy to access. Do yourself a favor and do the reflash/O2 sensor elimination at the same time. The right side O2 sensor plug is normally a mofo to get to, but with the tank off it's easy to access. Yup.....Easy peasy lemon squeazy with the tank off. Zenmoto, I just want to make certain that soldering the pump wires together after removing the pump is all that is needed to stop any fault codes from popping up. So there doesn't need to be any kind of resistor to mimic the pump still being there, is this correct? There are several ways to avoid the faults. It can be disabled with the flash, purchase a plug to close the loop on flea bay, or as you asked, cut the plug from the AIS and solder the wires together and plug back in which mimics the pigtail that can be purchased. This is the easiest and cheapest until you have it flashed. After its flashed, you can pull the plug if you like or leave it as is until you have a need to go back into(spark plug change) or whatever. Mine has been like this for about a year. Never had a fault. I flashed mine with FTECU software and autotune. I have the Graves EVO now and reinstalled the exup. If a better setup is out there, I don't know what it could be. Did this myself and it was easier than I expected. Highly recommend the 2wdw flash. can't see doing a decat and the block off without it. Also, search youtube for Ritchies Bikes fz10. he does a video tutorial that is excellent. Stupid question probably but do you have to drain the fuel tank before disconnecting the fuel line?